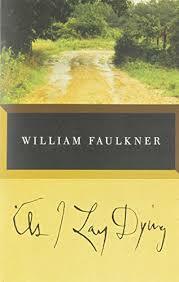 A Summary on As I Lay Dying discusses one of William Faulkner's most famous novels. One of William Faulkner’s famous novels is As I Lay Dying, first published in 1930. Faulkner wrote the book while he was working nights at a power plant. The novel employs no less that fifteen narrators over the course of its fifty-nine chapters, and often employs stream of consciousness narrative. As I Lay Dying is ostensibly about the death of Addie Bundren and her desire to be buried in her hometown of Jefferson, Mississippi. As the story opens, Addie is still alive, but near death. Her son is outside building her coffin, and the rest of the family attends to her. After she passes in the middle of the night, a thunderstorm washes out the bridge that the family must cross to take her body to Jefferson. Despite the rain, the family, which consists of her husband Anse and their five children, sets out with Addie’s body in the family wagon, encountering numerous difficulties along the journey. Anse, a proud man, refuses any help from people along the way, often forcing the family to go hungry and sleep in barns. Cash, one of the children, breaks his leg and winds up having to ride on top of the coffin. The God of Small Things Research Papers - The God of Small Things research papers on the Indian novelist Arundhati Roy. scholarly interpretations of literature. Symbolism in As I Lay Dying - As I Lay Dying Symbolism research papers examine the points of view of the characters in the novel and what their thoughts symbolize. Literary Meaning - Literary Meaning research papers delve into the deeper understanding of a work of literature that sometimes involves complex subtext that uncovers an author’s intention. Barn Burning - Barn Burning book reports delve into a short story by William Faulkner which reflects the social conditions of the U.S. during the depression. Barn Burning Summary - A summary on Barn Burning goes into one of William Faulkner's works about a fictional town in Jefferson Mississippi. Paper Masters writes custom research papers on an As I Lay Dying Summary and discuss one of William Faulkner's most famous novels.